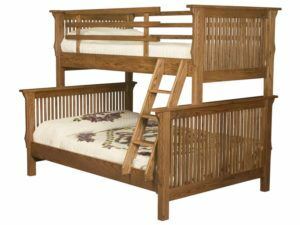 Here’s a lineup of children’s beds – including twin beds, plus full and queen beds. Amish cabinetmakers build each bed from solid hardwood. So they’re sturdy and durable. Plus, you’ll love the eye-catching styles. All reasons to choose your next bed from Brandenberry. 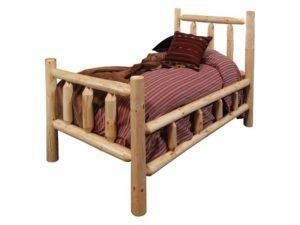 Beautiful wood construction accents the Carlisle Children’s Panel Bed. The Carlisle Children’s Slat Bed boasts a sleek wood finish. Sturdy Mission slats and a convenient design makes the Full-Twin Mission Bunk Bed a great youth bed. 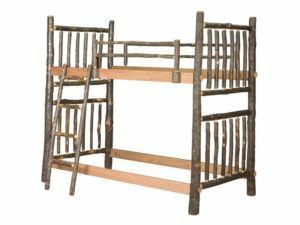 Fine hickory slats accent the Hickory Twin Bunk Bed. 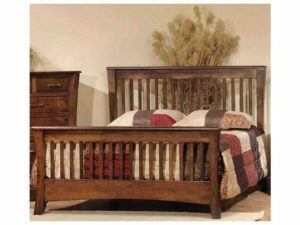 Rustic pine construction highlights the Rustic Pine Twin Bed. Choose a twin, full, queen or bunk bed from Brandenberry, and cherish the benefits of a solid hardwood, custom-made bed. Benefits like sturdiness, handsome looks and heirloom-quality construction. Sturdy construction. Skilled Indiana Amish craftsmen custom-build each bed. And the Amish men use solid hardwoods like oak, maple, cherry and hickory. So the traditional twin bed, twin over full bunk bed, twin storage bed or twin size bed frame you choose should – with proper care – serve you faithfully for decades to come. Full customization. If you like a unit shown, go ahead and order it as presented. Or you can tell us about the custom features you’d like. 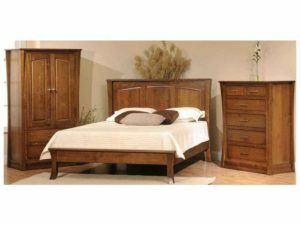 Start by choosing the wood species, finish, style and size of bed. Then, let us know what else you need. Short on storage space in your child’s room? Consider adding drawers beneath the bed. Also, if there is something you would like, but don’t see, be sure to ask. Visit us in Shipshewana, Indiana, and see why our children’s beds are not only durable enough to handle years of use, but beautifully crafted as well.